Netflix has been a huge hit in the US, and it’s now available to us in the UK. The service offers streaming movies and TV shows direct to your home for a one-off monthly fee. Netflix is a huge movies and TV rental service that’s been running in the US for some time. 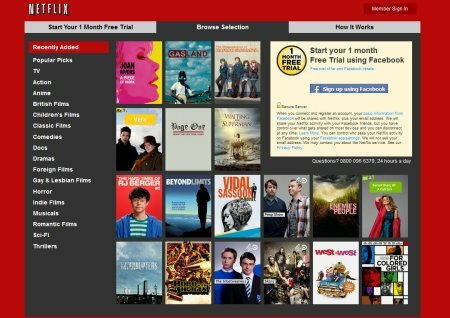 In 2012, the company launched its UK service, and you can now watch TV shows and movies over the Internet using the popular Netflix service. Content is offered by content providers such as BBC, ITV, Channel 4, Disney, CBS, MGM, Miramax, NBC Universal, Paramount, Sony Pictures, Twentieth Century Fox and Viacom. Other ways of watching Netflix are in the pipeline. We’ll be putting Netflix through its paces very soon, so please check back for a review of what Netflix has to offer. The big rival to Netflix in the UK, is the LoveFilm service. LoveFilm was acquired by Amazon in 2011, and the LoveFilm service mixes traditional DVD rentals via post with online streaming content. Other alternatives include Blinkbox, and Apple TV. See our Internet TV page for some of the other options. You’ll need a broadband speed of at least 500kbps for a stable video connection. You should also be aware that it’s important to make sure you’re aware of your Broadband download allowance. Streaming movies and TV shows will consume Internet bandwidth, and you should ideally be on an “unlimited” broadband package, to ensure that you’re not clobbered with extra charges from your Broadband provider.